This auction will have 700 pieces that include some of the biggest and oldest items in our collection. They include a Liquid Carbonics soda fountain from the 1893 Columbian Exhibition, large outdoor lighted signs, rare bottles, posters, banners, serving trays, lights and toys. There’s even a Pemberton’s 1880s French Wine Coca mirror pre dating Coca-Cola. The centerpiece of the auction is a soda fountain manufactured by the Liquid Carbonic Company for the 1893 Chicago Columbian Exhibition. 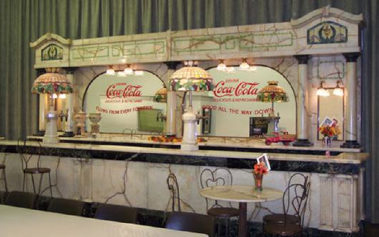 Made of marble and onyx with exquisite veining, the soda fountain is extremely ornate. It’s actually two pieces – a customer counter and a back bar. With each piece 24′ in length, it is among the largest items in the museum. 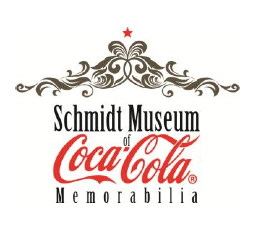 For more information and photos about items to be auctioned, please visit The Schmidt Museum. and I can email a picture of my tray. I tried emailing you at the above address but I just get a bounce back. Please email me the picture of the tray to bcardonarivera(at)optonline.net. There are many replicas out there so we need to make sure it is from the early 1900s and not from the 70’s when reproductions were made. My Dad was a driver for Schmidt, yrs later Bill Schmidt purchased my Dads collection after many yrs of collecting Coca Cola signs etc. Ignorant of its actual value, Dad trusted Bill and sold him everything for his offer which was pennies of its actual value. Many local people cant stand the piggy rich Schmidts as they have done absolutely nothing for the city or anyone. Employees for the Coca Cola plant were all screwed and lied to. His son Larry Schmidt is just as arrogant and thinks everyone owes him something here. Feel sorry for his wife as she is actually nice! Schmids never had a passion for Coca Cola collectibles ..only what its monetary value is. Their supposed donating to Charity is the biggest lie and scam of it all. Glad they are moving to Florida. I’ve just put up an authentic 1900 coca cola tray on eBay. It’s auction number is 130691441721. I have had numerous comments on this tray saying that I’m “giving it away” and would like to know the real value on this item. Some of the numbers I’ve been messaged are incredibly high and I would like your feedback if possible. Thank you. Hi, Jenn. Just sent you an email. The last auction scheduled for Mar 24 was cancelled and everything sold? Way to go Schmidts.. they break their own advertised auction. How loyal to the auctioneer and collectors hoping to get a piece of vintage items is that? Shows their true $$$ Colors! Of course, the website thanks all the loyal collectors and everyone for lining their pockets.